Harrow sections are available in 4'-0", 6'-0", 8'-0" and 10'-0" widths with a standard depth of 8'-0". They are manufactured from 1/2" diameter high quality steel. Sections can be carried in multiples on drawbars ranging from 4'-0" to 18'-0" using 4'-0", 6'-0", 8'-0" and 10'-0" sections. SPARE PARTS - click here to download brochure. 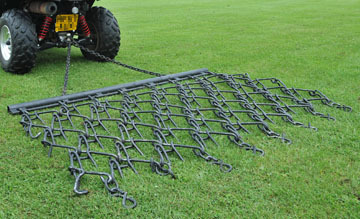 Harrow sections are available in 4'-0" and 6'-0" widths with depths of 6'-0" and 8'-0". They are manufactured from 5/8" diameter high quality steel. Sections can be carried in multiples on drawbars ranging from 4'-0" to 18'-0" using both 4'-0" and 6'-0" sections. 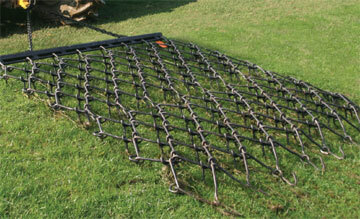 Harrow sections are available 4'0" and 6'-0" wide by 4'-0" deep with 1/2" diameter tines. 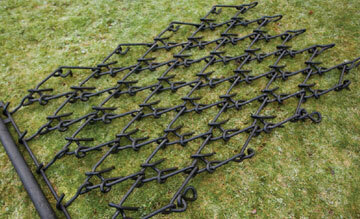 These Junior size harrows can be used with garden tractors, ATV's and pick-ups. If you have any questions about this product or any others in our range, please don't hesitate to contact us.